Browse: Home /	Community Building, Community Gardens, Events, Street Gardening, Sustainable Flatbush News, URBAN FARM & GARDEN / The Greenest Block in Brooklyn to be honored at this Sunday’s Greening Flatbush!!! 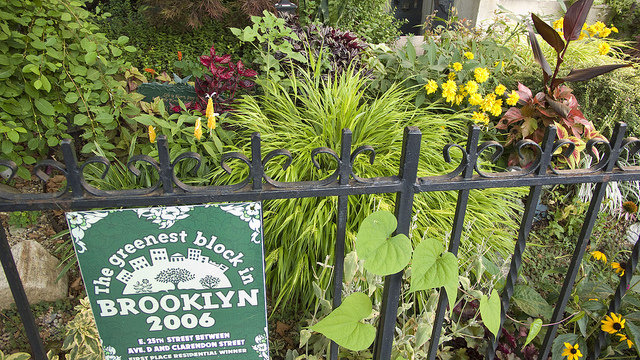 The Greenest Block in Brooklyn is an annual contest of Brooklyn Botanic Garden’s (BBG) GreenBridge, promoting streetscape gardening, tree stewardship, and community development in Brooklyn. Flatbush’s East 25th Street (between Avenue D and Clarendon Road) was named the greenest residential block in the borough for the 3rd time in 2011, having previously won this award in 2004 and 2006. This block, and the group of neighbors who garden there, is an inspiration to the Flatbush neighborhood and to all Brooklynites. They successfully demonstrate how to use gardening to create a beautiful urban environment and to bring neighbors together to build a close-knit community. In addition, the group will conduct a workshop at this year’s event, titled “How to Create a Thriving Block Association Through Gardening”. Like their previous workshop presentations at Making Brooklyn Bloom, this will be engaging, inspiring and should not to be missed. Look forward to seeing you all on Sunday, March 25 at the Flatbush Reformed Church!